How strong will Hurricane Florence be when it hits landfall with full force? If this live camera shot on YouTube from Explore.org is any indication, it will be incredibly strong. Take a look at this live camera shot below, which at time of publication was still hanging on by a few threads, from somewhere out in the Atlantic Ocean. The sound of the wind provided a glimpse into just how intense this storm truly was at that moment—now, all is calm and the flag somehow still stands. 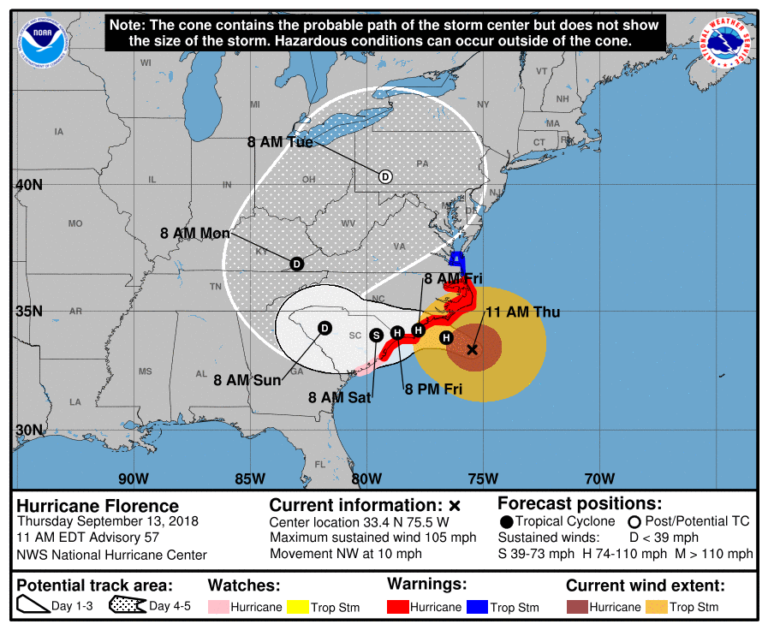 While many in the Carolinas—particularly in Wilmington, N.C. and Myrtle Beach, S.C—have already started to feel Hurricane Florence’s impact, the center of the storm is expected to make landfall sometime after 8 p.m. Thursday. So far, according to North Carolina Gov. Roy Cooper, more than 7,000 residents have taken refuge in the 108 hurricane shelters the state has opened for those under mandatory evacuations, according to WTVD-TV. Hurricane Florence was downgraded to a Category 2 storm Wednesday night, leading some to think the impact might be less dangerous. However, the hurricane is still approaching the East Coast with maximum sustained winds around 105 mph and gusts of 125 mph. “Wind speed may have dropped some from yesterday, but we traded that for a larger wind field,” Cooper said Thursday morning, noting the width of the potential impact now stretches for 200 miles. Faith-based charity organizations like Operation Blessing International and Samaritan’s Purse, which is headquartered in North Carolina, are preparing now to aid those who might be impacted by Hurricane Florence. The Rev. Franklin Graham, president of Samaritan’s Purse, appeared on Fox News Thursday morning, urging those who are able to volunteer to help with potential rescue and storm relief. The second area will be located in Virginia Beach at the Christian Broadcasting Network headquarters. Both locations will have mobile kitchens capable of making 9,000 hot meals in Emporia and up to 3,000 in Virginia Beach. #HurricaneFlorence is projected to strike the Carolinas this week with devastating force. Please continue to be in prayer for all those in the path of Hurricane Florence and for the first responders and volunteers positioned to help those who might be hurt by the storm.